Custom stage rentals can be used for all types of events. 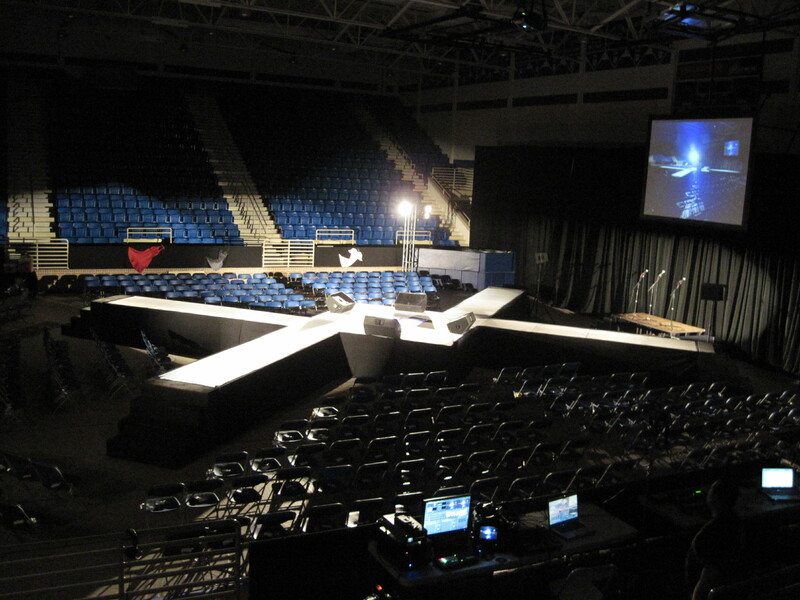 From X-shaped runways, to rounded corners, or triangular or trapezoidal stages – our carpenters and talented event staff can provide the exact stage rental you need for your live event. Video crews love our staging rentals because we can also provide multi-level staging and infinite walls. We have even provided rental stages with partially clear surfaces for camera shots from under the stage! When it comes to providing custom rental stages for live events, no other staging rental company beats the staging professionals at In Depth Events. No stage is too large or complex. And we use our experience to provide safe, sturdy structures that can easily be engineer certified. We start with a CAD drawing, incorporating the venue size, production and decor elements and the desired stage size and type. This CAD is then rendered to show elevation for multi-level stages and textures are then added to show color and logos if applicable. The end result is a 3-D model with the exact dimensions you need for your custom stage rental. From the CAD, our event staff can work with our carpenters to provide quotes for your custom rental stage. You’ll find our event staff to be friendly and professional. We will always use our expertise in staging to help your dream stage become a reality. We will always work with your budget to get the look you need for your event. On day of load in, our event crew will be there early with tools in hand and professional attitudes. Watch the sawdust fly as the custom pieces are integrated into our staging structures. A custom stage rental resembles a giant puzzle being put together – so sit back and watch our crew put it all together within the time constraints needed for your successful load in and show. Ask Us a Question to find out how our event staff can make your ideas for a custom stage rental become reality!